Have you ever thought about the title you'd give your life story? Memoirs are part fact, part fiction, part message. What would yours be? What is Damon Tweedy's? 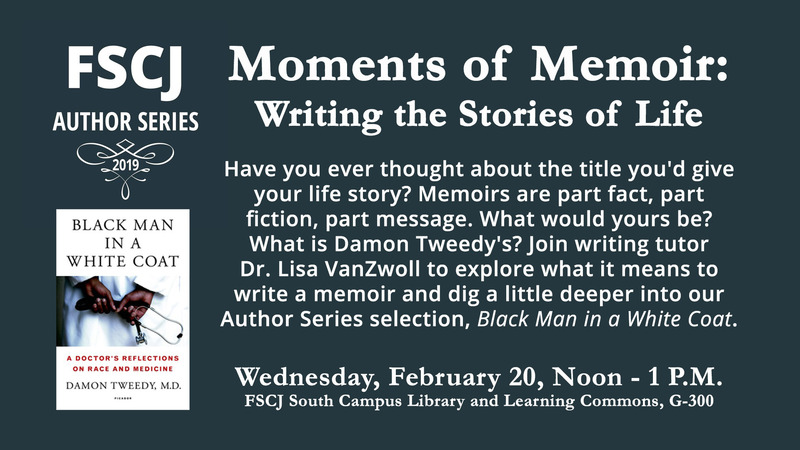 Join writing tutor Dr. Lisa VanZwoll to explore what it means to write a memoir and dig a little deeper into our Author Series selection, Black Man in a White Coat. This event will take place in room G-300 of the South Campus Library and Learning Commons, located at 11901 Beach Blvd, Jacksonville, FL 32246.